So about even with S&P500 returns since July? It would be nice if you posted an appropriate benchmark along with your results. From my own similar experience, small-cap value investments only kept pace with large-caps in the past 6 months. If you add back currency changes and taxes, the fund has performed better than the S&P 500. However, to your point about reporting such comparisons, it is too premature in my opinion. Perhaps after a few years such comparisons would be meaningful, but for now they would only encourage activity that attempts to beat the average whenever quarterly results come out, which is not in the best interests of shareholders. How do you calculate the units of your portfolio? How do you manage cash paid in/out? 1. Use the new cash to buy additional shares of existing portfolio holdings in proportion. Although you keep the same portfolio balance, you may be purchasing shares at a higher price. 2. Purchase whatever shares appear most attractive at the time of the cash contribution. 3. Hold the cash until attractive opportunities arise. Each of these presents problems. The most notable issue is whether you "segregate" these holdings until the end of the year when the member/partner interests are apportioned. You wouldn't want new contributions left as cash to drag down the overall returns of the other partners. I'm also curious as to what you think about this. Thanks Mike B, That's exactly what i wanted to know. Saj, Do you have any framework, template with which you do this Fund's calculations? 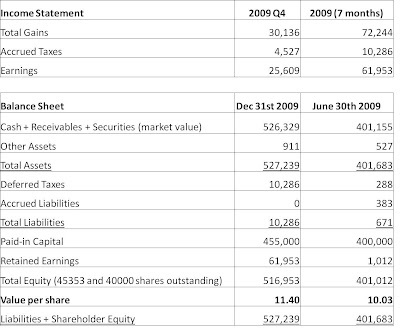 - Does your income shown in Income statement contain only profit made from buy/sell? or you include dividends also? - How do you keep track of commissions? There's no hard rule. All three options you discuss are on the table, depending on the circumstances (market conditions, opportunities available etc). The funds are not segregated, however, and immediately become part of the entire pool. Do you use software to keep track of the fund accounting records, or do you do it all manually? Most of the software packages I've seen to handle this have been rather pricey. To keep costs down I generally stick to free software, so there are some manual elements to it.